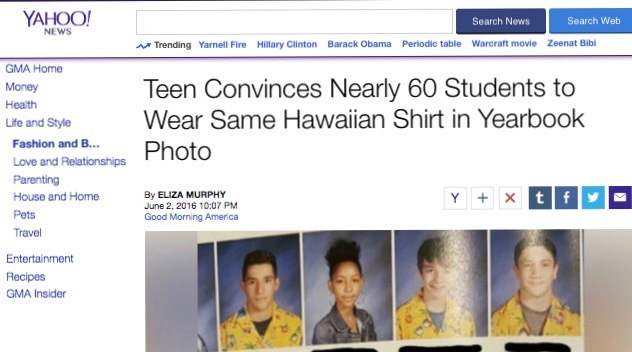 It started with one student’s idea, five bright yellow (some might even say tacky) Hawaiian shirts and 10 Sleepy Hollow High School students who agreed to wear the shirt for their yearbook photo. Then another one agreed, and another, and another. And before he knew it Dave Husselbee, a junior at Sleepy Hollow High School, had 60 of his classmates on board and even had faculty members ready to come together and say “Aloha!” in their yearbook?photos. Some of the staff was unsure but once the chair of the science department decided to do it, all the others were enthusiastic, Husselbee told Yahoo News. Once a studnet?was finished taking their photo, they would pass the shirt onto their fellow classmates. When word about the story got out, it hit national news outlets like ABC and FOX News. Sleepy Hollow High School Principal Carol Conklin-Spillane said she was pleased to see the vibrant colors splashed on the pages of their yearbook and how the school’s students and faculty get along so well. The best part is that this is who we are here at Sleepy Hollow High School, she told Yahoo News. You can check out the all the yearbook photos in Yahoo News below. Mahalo to Sleepy Hollow students and staff for their beautiful idea and making everyone smile!